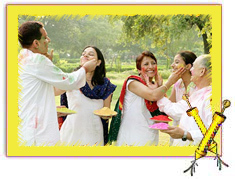 Ideally, the joyous festival of Holi is meant to celebrate the arrival of Spring while the colors used in Holi are to reflect of the various hues of spring season. But unfortunately, in modern times Holi does not stand for all things beautiful. Like various other festivals, Holi too has become ruthlessly commercialized, boisterous and yet another source of environmental degradation. To de-pollute Holi and make it in sync with nature, as it is supposed to be, several social and environmental groups are proposing a return to more natural ways of celebrating Holi. The aim of this articles is to generate awareness amongst people about the various harmful effects around Holi celebrations and encourage people to celebrate an eco friendly Holi! In earlier times when festival celebrations were not so much commercialized Holi colors were prepared from the flowers of trees that blossomed during spring, such as the Indian Coral Tree (parijat) and the Flame of the Forest (Kesu), both of which have bright red flowers. These and several other blossoms provided the raw material from which the brilliant shades of Holi colours were made. Most of these trees also had medicinal properties and Holi colors prepared from them were actually beneficial to the skin. Over the years, with the disappearance of trees in urban areas and greater stress for higher profits these natural colours came to be replaced by industrial dyes manufactured through chemical processes. Around 2001, two environmental groups called Toxics Link and Vatavaran, based in Delhi, did a study on all the three available categories of colours available in the market - pastes, dry colours and water colours. The study revealed that all of these three forms of chemical Holi colors are hazardous. According to their researched fact sheet on Holi, the pastes contain very toxic chemicals that can have severe health effects. Please check the table below to know about the chemical used in various Holi colors and their harmful effects on human body. The dry colours, commonly known as gulals, have two components – a colourant that is toxic and a base which could be either asbestos or silica, both of which cause health problems. Heavy metals contained in the colourants can cause asthma, skin diseases and adversely affect the eyes. Wet colours, mostly use Gentian violet as a colour concentrate which can cause skin dis-colouration and dermatitis. These days, Holi colours are sold loosely, on the roads, by small traders who often do not know the source. Sometimes, the colours come in boxes that specifically say ‘For industrial use only’. Navdanya, Delhi published a book called Abir Gulal, which spoke of the biodiversity that was the source of natural colours. Development Alternatives, Delhi and Kalpavriksh, Pune have developed educational tools to teach children simple ways of making their own natural Holi colours. The CLEAN India campaign has been teaching children how to make beautiful natural colours. Yellow liquid color Soak peels of pomegranate (Anar) overnight. Orange - red paste Henna leaves (mehndi) can be dried, powdered and mixed with water. For more information please read How to make Natural colours? For those who do not have the time to make their own colours, there is the choice of buying natural Holi colours. Several groups are now producing and promoting such colours, although it is important to verify the ingredients of the colours and ensure you know enough about the source. The burning of fuel wood to create the bonfire for Holika Dahan presents another serious environmental problem. According to a news article, studies done in the state of Gujarat reveal that each bonfire uses around 100 kg of wood, and considering that approximately 30,000 bonfires are lit in the state of Gujarat just for one season, this leads to a wastage of a staggering amount of wood. Groups such as Sadvichar Parivar are now advocating one symbolic community fire, rather than several smaller bonfires across the city as a way to reduce wood consumption. Others are also suggesting that these fires be lit using waste material rather than wood. In the current situation, when most cities in India are facing acute water scarcity, the wasteful use of water during Holi, is also being questioned. It is common for people to douse each other with buckets of water during Holi, and children often resort to throwing water balloons at each other. The idea of a dry Holi seems alien at first, especially as the climate becomes warmer around Holi, and the water provides welcome relief from the heat. However, considering that in some urban areas, citizens can go without water for several days, it seems wasteful to use so much water simply for a celebration. It is a relief to notice that the awareness about the environmental impacts of celebrating Holi are being brought to light by various NGOs. And gradually, more and more Indians are choosing to turn to a more natural and less wasteful way of playing Holi.